License managers may sometimes label licenses as occupied, when in fact they are idle and wasting limited company resources. 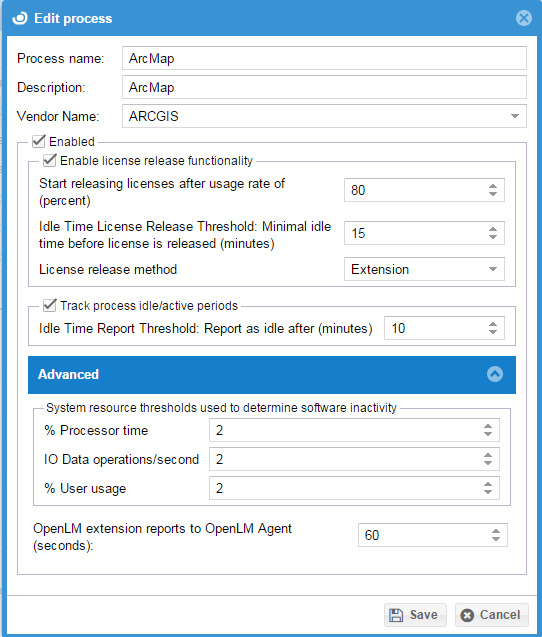 System administrators can utilize the OpenLM EasyAdmin web interface to identify such conditions and retrieve idle licenses either manually or automatically. If the user has not been actively using the license, the idle time period would be shown in the OpenLM EasyAdmin ‘Start’ → ‘Operational’ → “Currently consumed licenses” → “Recent App. Idle period” column. This information is sampled by the OpenLM Agent module on each client workstation, and propagated to the OpenLM server. 1. Make sure you have OpenLM Agent installed on the end user’s workstation. 2. Open the Easy Admin tool: Windows Start → All Programs → OpenLM → OpenLM EasyAdmin. 3. Click the EasyAdmin Start button. Select Administration. 4. Select Process / Features. b. Select All Programs → OpenLM → Agent → Tools → Processes List. The following ‘Processes’ table window appears. c. Find the required process and copy its exact format name (case sensitive). d. In order to add the new process to the currently managed processes’ list, click the Add icon in the Process List frame, on the top right – hand side of the Process features window. The Add process window will appear. For processes that already exist in the process list, select them and click Edit. An identical Edit process window will appear (see below). e. Add features to the selected application. You can add features one at a time by clicking the Add + on the bottom-right corner of the Process features window, or all of them by clicking the Add All Vendor’s features +. Type the “Process name” as obtained in item 5c (above), e.g: ArcMap. Check the Enabled box, and the Save Process Activity box. Set the System resource thresholds. These numbers indicate the thresholds under which a process is considered idle. Set the Idle time report threshold. This is the minimal period of time before an inactive session is reported as idle. After completing the process described above in paragraphs 1 through 6, the Active Agent is set to monitor the managed process. To open the EasyAdmin Currently Consumed Licenses (CCL) Window: EasyAdmin Start → Operational → Currently Consumed Licenses. This window lists all currently active sessions. Using this window, Administrators can monitor individual workstations that run licensed applications. They can detect idle applications, and shut them down with a mouse click. In order to do so, an OpenLM Agent module must be installed on each client workstation. The end user’s workstation idle time is recorded and presented in the “Workstation Idle time” column. Records the recent idle time of a specific application. A lingering license stays checked out for a specified period of time beyond its check-in or FlexEnabled application exit, whichever comes first. The Linger Due is the actual time the license is returned to the pool to be claimed by another user. Click the dark-shaded crescent moon icon for a graphic view of idle and active time as well as a list of idle periods. The end user must have been inactive for a minimum period of time in order for this license to be retrieved. This value is set by default to 5 minutes in compliance with FLEXlm license manager’s limitations. If the license is not associated with any real product activity on the specified workstation (as happens when a license gets artificially “frozen” on a computer), then the license will be released and returned to the pool of available licenses. If the worker is actually using the product, then re-obtaining a license would be automatically attempted. If this happens the license for that product and workstation will reappear on the active products screen, with a new handle number. Manual License removal does not work for ArcGIS 10. In order to manually close an application on the workstation, an administrator should highlight the relevant row, and click the Close Application icon . This operation will retrieve the license back to the license pool, save the open project, and the application itself will be shut down. It requires a proper installation of the OpenLM Agent module. It works only on extension enabled applications. At the time of writing this revision (Rev 2.0), these include Matlab, ArcGIS and AutoCAD. At the time of writing this revision (Rev 2.0), These features are only applicable to the FLEXlm license manager. An OpenLM Agent module must be properly installed on each Client workstation. Borrowed licenses (AKA “Linger licenses”) can not be retrieved via the EasyAdmin application.